Kevin Buist is the exhibitions director for ArtPrize—a radically open international art competition in Grand Rapids. The 2006 Calvin alumnus shares his thoughts on what’s new atArtPrize this year and what social and economic impacts an event like this has on a city. Now in its fifth year—what’s new, fresh for the 2013 edition of ArtPrize? The artwork is always new. There are 1,524 artist projects that have never been in ArtPrize before. A new thing that we’re doing is launching ArtClub. It’s a membership program for individuals and families to support ArtPrize. 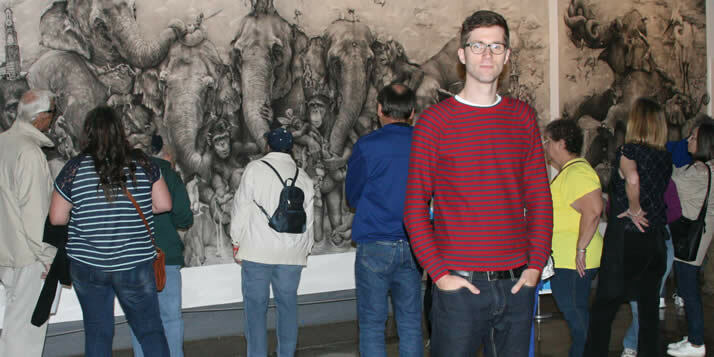 There are a host of great perks, including an exclusive lounge and the ability to purchase a limited edition print of last year’s first place winner,“Elephants” by Adonna Khare. ArtPrize was recently named one of Time Magazine’s top five festive events you won’t want to miss in 2013. What’s your reaction to this recognition? We’re thrilled. We’ve always had a sense that what we’re doing is unique in the world, and it feels good to be recognized. What topics/issues will you be talking about at this year’s ArtPrize Speaker Series? The Speaker Series this year focuses largely on cities. There are three events that explore this theme from various angles. On September 24 at 7 p.m. at the ArtPrize HUB (41 Sheldon SE, GR), we’re hosting “The Re-Imagined City” a conversation between Eva Franch i Gilabert, executive director and chief curator of Storefront for Art and Architecture in New York City, and Reed Kroloff, director of Cranbrook Academy of Art & Art Museum in Bloomfield Hills, Mich. They’ll speak about the challenges and opportunities that come with architectural interventions in existing urban spaces. Then, on September 26 at 7 p.m. at Calvin’s Ladies Literary Club (61 Sheldon SE, GR) we’ll host a panel discussion called “Can Art Save Cities?” This one is special because it features the three jurors who will determine the $100,000 juried grand prize. We’ll discuss the relationship between contemporary art and urban renewal. Finally, on October 1 at the Hub at 7 p.m., we’ll host “Artist-Run Michigan” which will feature six short presentations by artist-run initiatives from all over the state. How do you see ArtPrize impacting the urban revitalization of Grand Rapids? This is an interesting question, because it can be answered in both quantifiable and unquantifiable ways. As far as what’s quantifiable, we know that it brings a huge number of people to downtown Grand Rapids, and that has a significant economic impact. Our attendance this year is expected to exceed 400,000 people in 19 days. In 2011, we had an independent economic impact study done that found that the event generated $15 million in economic activity. As for what’s harder to measure, the event has become a signature event for the city, which has a lot of cultural implications. All of the major museums and universities have built ArtPrize into their yearly programming schedules. We’re beginning to see exciting independent programming happen alongside ArtPrize, that benefits from the influx of people and interest. What impact does ArtPrize have on local artists in terms of exposure, validation of their work, etc.? While ArtPrize is a signature event for Grand Rapids, it has always been a place for artists from all over the world to meet and exchange ideas. ArtPrize is a bit like a tidal wave when it comes to local artists. Artists need to choose whether to ride the wave or take cover, and we’ve seen both. Making the most of the event is very rewarding, but also very taxing, so we’ve seen local artists vary their involvement year over year, and that’s probably healthy. What lasting impact does an event like ArtPrize have on small art galleries, like Calvin’s (106) gallery? ArtPrize gives small galleries like 106 the opportunity to have access to artists and audiences that they normally wouldn’t. This can have a lot of benefits for year round programming, both in terms of marketing future exhibitions to crowds, as well as building relationships with artists that can be expanded later. This entry was posted in (106), Alumni, Art Prize, Grand Rapids. Bookmark the permalink.